we would still be debugging code. On December 14, 1 met with Dave Sumner, KLZZ, ARRL General Manager, and obtained his oral approval of ARRL sponsorship of the second packet conference and to release a call for papers. Below is what I plan to publish in the January AMRAD Newsletter which should go to the printer on December 17. I will also take care of sending it as a news release to amateur magazines and newsletters with national coverage and packet clubs other than the West Coast. You can go ahead with West Coast publicity. 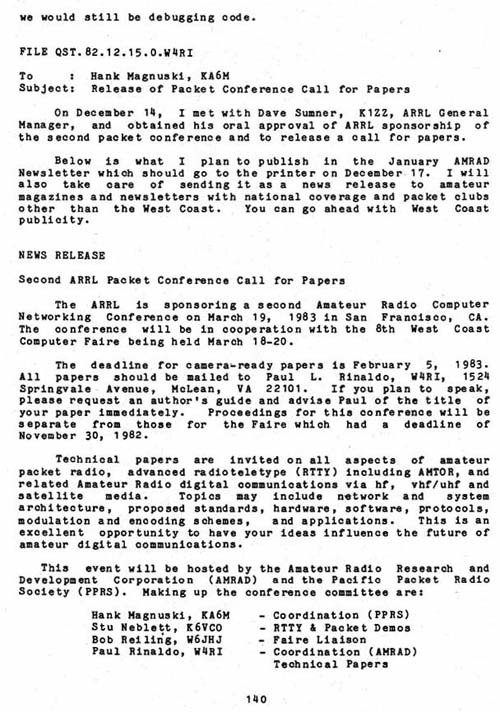 The ARRL is sponsoring a second Amateur Radio Computer Networking Conference on March 19, 1983 in San Francisco, CA. The conference will be in cooperation with the 8th West Coast Computer Faire being held March 18-20. The deadline for camera-ready papers is February 5, 1983. All papers should be mailed to Paul L. Rinaldo, W4RI, 1524 Springvale Avenue, McLean, VA 22101. If you plan to speak, please request an author's guide and advise Paul of the title of your paper immediately. Proceedings for this conference will be separate from those for the Faire which had a deadline of November 30, 1982. Technical papers are invited on all aspects of amateur packet radio, advanced radioteletype (RTTY) including AMTOR, and related Amateur Radio digital communications via hf, vhf/uhf and satellite media. Topics may include network and system architecture , proposed standards, hardware, software, protocols, modulation and encoding schemes, and applications. This is an excellent opportunity to have your ideas influence the future of amateur digital communications.